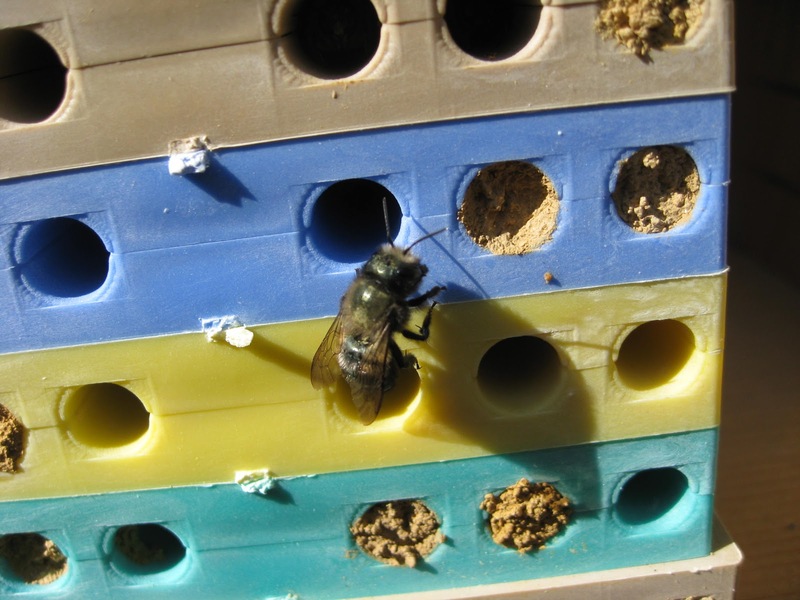 An Eastern Carpenter Bee and numerous mason bees make use of two artificial bee structures. About 30% of our region’s 450 or so bees nest above ground. Many do so in dead trees, borer beetle burrows, and in stems of plants with soft or hollow stems and piths like elderberry, sunflower, sumac, and blackberries. This is one more reason to leave garden plants standing through the winter, as many are housing insects in various parts of their life cycle, including pupating or adult overwintering bees. Ecologically minded gardeners don’t tidy up (unless removing diseased plants) until spring, along with of course planting non-cultivar native plants. Even better is to cut the tops off about a foot high, leaving the stems for bees and other insects to use for the following season. Since many bees need help in getting into a stem, the open tops are perfect for this. Native plants not only provide nesting and nectar sources, but 35% our native bees are oligolectic, needing the specific pollen of the plants they evolved with in order to be able to reproduce. An Elderberry shows signs of where woodpeckers have foraged for mason and other cavity nesting bees. These mostly solitary bees include Small Carpenter Bees (Genus Ceratina, about 24 species in North America, 4 locally), Large Carpenter Bees (Genus Xylocopa, only the Eastern Carpenter Bee, X. virginica, is common around the DC region, though the Southern Carpenter Bee, X. micans, has been found in southern Virginia), Leafcutters (Genus Megachile, about 130 species in NA), Mason Bees (Genus Osmia, about 150 species in NA, 27 east of the Mississippi, though several other Genera such as Hoplitis and Chelostroma are also often called mason bees), and a few other types which use cavities or take advantage of above ground structures. After planting native plants, limiting use of pesticides/ herbicides/fungicides, leaving garden bed plants standing throughout the winter, leaving some old stems standing cut a foot or so high, and allowing your lawns to have some clover and other perhaps weedy looking flowers, there are some other things that you can do to make your yard more bee friendly and appealing to many pollinators. In many parts, bee/insect “hotels” are becoming quite popular. An insect hotel geared for bees at Audubon Naturalist Society headquarters in Maryland. But you needn’t make things so extravagant, unless of course you want to. 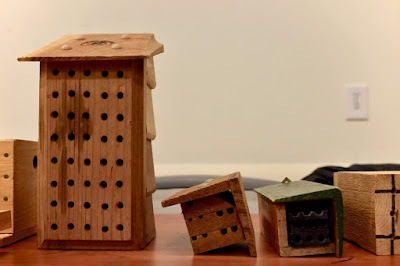 While there are numerous types of bees that will make use of artificial structures, mason bees are the most common, and luckily what works for them will generally work for others. Simply changing the size of the openings to the structures often is enough for the other cavity nesting bees (and many other insects). Blue Orchard Mason Bee, the most common native mason bee. 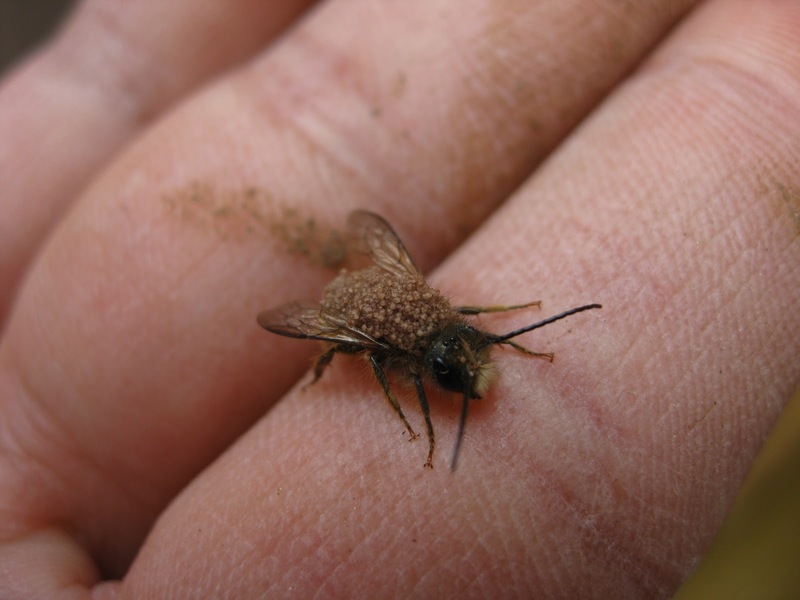 Mason bees (including Osmia lignaria and others) are small, dark bees that do not live in large social hives, but are actually solitary (like most of our 4,000 species of native bees in North America). They tend to be primarily active in the spring. They also can work at lower temperatures than the introduced European honey bee. They are very peaceful, only using their weak sting if grabbed or trapped inside clothing and do not swarm. Although not honey producers, they are superb pollinators, especially under questionable spring time conditions. Individuals supposedly can visit more plants per hour and in many cases can be up to 90% more efficient at pollination than the introduced European honey bees. Mason bees also carry their pollen on their hair (scopa) underneath their body so often pollinate more flowers than honeybees that carry their pollen moistened in “baskets” on their back legs (leading to less pollen contact with another flower). This pollen also tends to be dry and pollinates easily where honeybees often use nectar to wet the pollen they carry so it does not fall off as easily to pollinate the flower. Mason bees tend to prefer flowering shrubs over plants but will visit whatever is available. Two introduced Japanese Horned Mason Bees are also becoming quite numerous in our area, and are the most likely ones you will attract. In the wild, orchard mason bees (as they are sometimes called) use hollow stems or cavities in trees to nest in (they do not make their own holes). 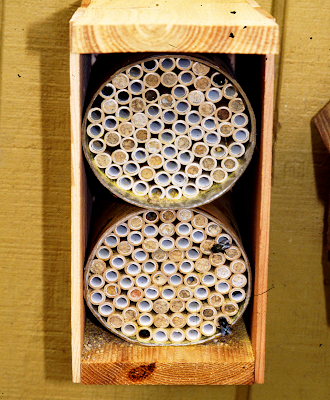 Many commercially available bee houses with replacement tubes are sold for them to utilize. It is also quite easy to make some suitable homes for them. One simple way is to cut some bamboo, Phragmites (a good use for both these invasives), elderberry, and/or sumac at their nodes, hollow them out all the way to the node so one side is still sealed, and bundle them together (with the open ends facing one direction) for the bees to discover. Place them where they will get some sun in the morning and some shelter from the rain. The bundles do not have to be all even at the open end since that makes it even easier for the bees to orient themselves to their own nests. From 5-8 inches long is fine. Various entrance-hole sizes will work but a good compromise size is 5/16inch in diameter. A structure supporting both blocks with drilled holes and bamboo built as an Eagle Scout project as part of a pollinator patch in Arlington Virginia. Another way is to drill some 5/16in diameter holes (or you can vary hole sizes) in some untreated pieces of wood (sections of 2x4’s or bigger is even better). Make each hole ¾ inches apart from any other on all sides. The deeper the holes the better (6 inches or so but again not all the way through) since female eggs are laid towards the rear of any tunnels. The more longer-lived females you have, the faster your population can grow. Luckily nesting bees show great nest fidelity and tend to try and use the same area each time. Place the pieces of lumber so they can get morning sun and some protection from the elements much as you would with the bamboo and other cut stems. Some large diameter wire screen across the front will help keep woodpeckers or rodents from eating them, but still allows the bees to do their thing (something smaller than chicken-wire). 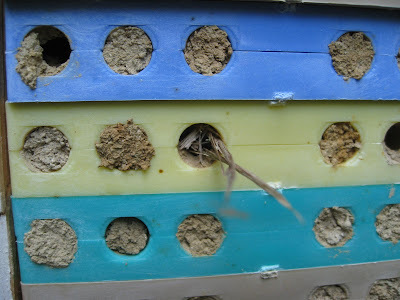 Provide some moist soil nearby (preferably clay based) so they can construct their nest cells. Try to have your nesting structures for them out by mid-March around here since more female are produced earlier in the year than later. The bees tend to be active for just a little over a month each (each bee lays about 35 eggs) so you want to be ready for them. This works for most blue orchard bees, but there are many other different bee species. For this reason, some people experiment with different size holes to attract whatever local types might be around. In the Fall, some people put the nests in a cool place like a shed to protect them from predators. Other people carefully remove the containers (straws or open plastic tubes often commercially) as they fill and put out fresh nesting holes. The stored containers should be placed right-side up with the mud-sealed openings towards the top, in a protected shed or other place that undergoes conditions similar to the outdoors. Care should be taken not to jostle them very much so as to not dislodge the developing young or eggs. Some people even refrigerate them after September and “activate” them just before they need them for their orchards or plants. For more instructions on building or providing bee “homes” check out the Xerces Society: http://www.xerces.org/wp-content/uploads/2008/10/nests_for_native_bees1.pdf. 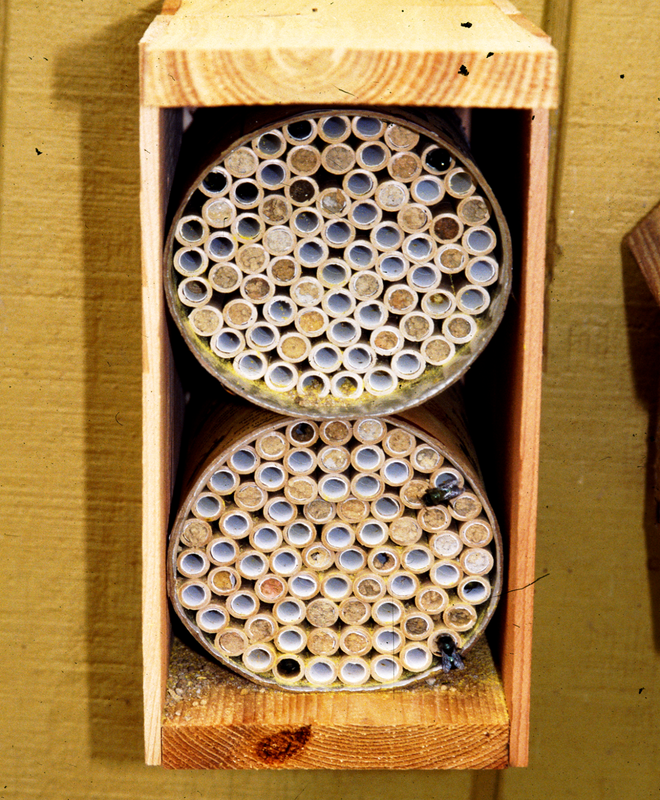 A commercial mason bee system consisting of cardboard straws with paper inserts that can be cleaned and replaced yearly. Commercially available systems and boxes are sold and most work fairly well. Most people agree that paper straw inserts and tubes will work, but some are better than others. Waxed paper tubes tend to keep the nectar from drying out and are an improvement and those made out of cardboard are even better. Wood is best since it offers the best protection from predators like Chalcid wasps but can’t be re-used too often without parasite problems (unless you use paper straw inserts in them). Bamboo and plant stems can crack and offer less protection from predators or parasites. The bees also prefer darker colors and you should also try not to clump too many holes or tubes together since the bees can get disoriented as to which exact hole is theirs. Some folks insert different color paper straws to help the bees find their own home easier or simply paint the edges different colors to help the bees orient themselves. Plastic straws do not work and lead to fungal problems. A Blue Orchard Mason Bee utilizing a commercial plastic bee box system which can be pulled apart for cleaning and has multiple colors to help the bees find their individual holes. Populations often build quite well from year to year. But there are issues with placing so many solitary bees so close together. This unnatural situation attracts many predators. More so, it allows for the build-up of illness, fungal issues, and parasites. For that reason many people change them out or clean them yearly. After several years, many also move the structures to new areas. All this helps with these high population issues. 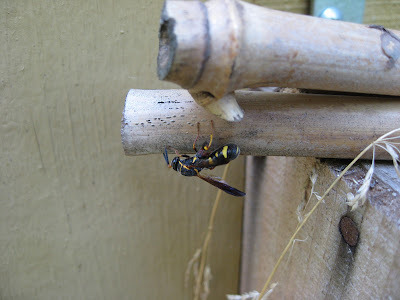 A Leucopis Chalcid Wasp searches for a place to insert her ovipositor to parasitize a mason bee tube. A male mason bee covered in pollen mites. In large numbers, these can be harmful to bees. Populations can build up in colonies or when using the same holes/tubes each year. 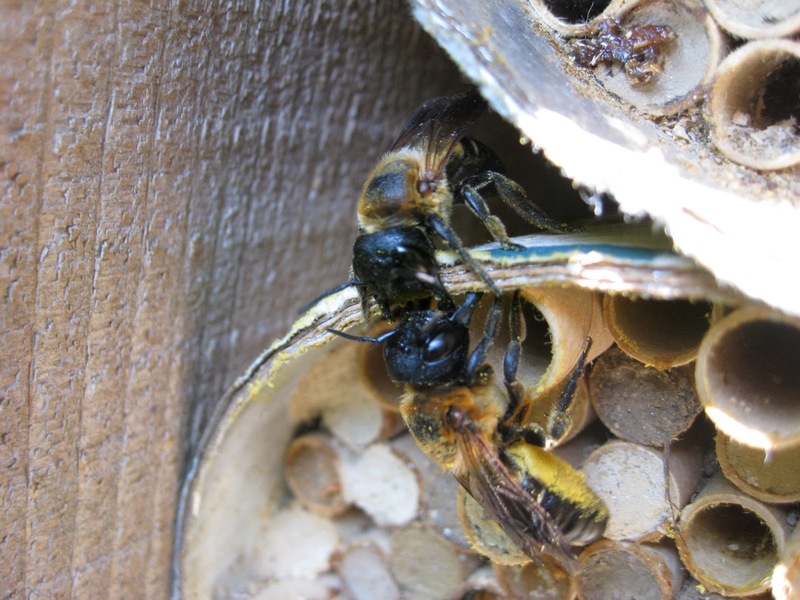 As mentioned, 2 nonnative Japanese horned bees (the Japanese Hornfaced Bee Osmia cornifrons and the Taurus Mason Bee Osmia taurus) are now quite prevalent and are the most likely mason bee to be attracted, as they are less picky about where they nest and reproduce quickly. Whether or not they are harmful to the native bees through competition for limited nesting sites or nectar sources may yet need to be proven, but I’ve noticed that as the nonnative numbers build, the native blue orchard native bees, and leafcutter bees who also may use the nesting tubes later in the season start to decline. The two Japanese Hornfaced bees are the most likely mason bees to be attracted to man-made structures. As is sometimes the case for cavity nesting bees, the male is smaller, has a white face, and longer antennae. There’s also a much larger nonnative bee, the Giant Resin Bee (Megachile sculpturalis) that is now getting common in our area. They compete with cavity nesting bees, and I believe they will pull out or disturb the other bees’ nests when they can, nesting later than many native bees. For more about them, read this blog article I put together on them: https://capitalnaturalist.blogspot.com/2015/07/giant-resin-bees.html. Two nonnative Giant Resin Bees fight over a nesting space. Notice one has pollen all over its scopa, or belly "hairs". 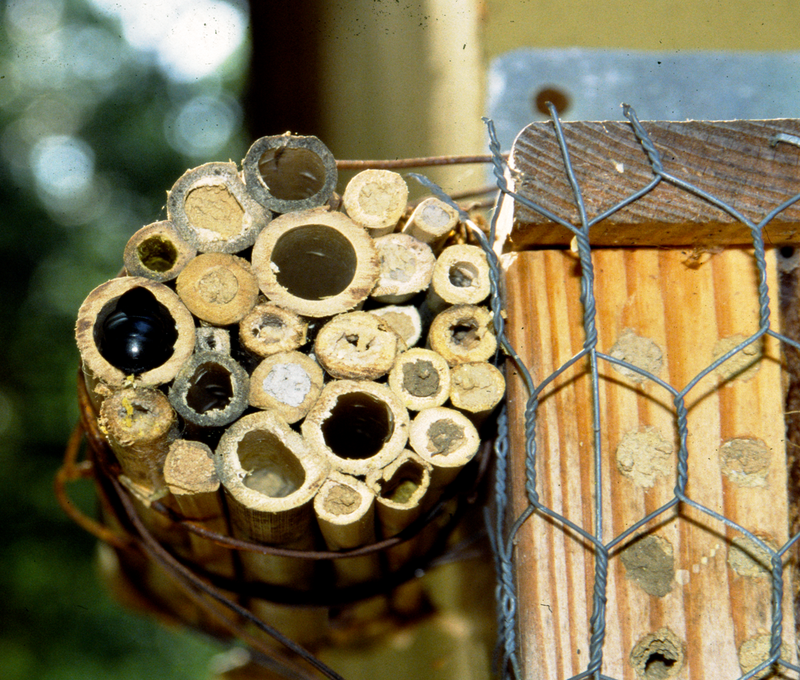 Many other types of bees, wasps and other creatures make use of these type of nesting structures too, including mason wasps, leafcutter bees, and grass-carrying wasps. A Grass-carrying wasp has made its nest among numerous mason bee nests. Though it may look very similar, the smooth features make this more likely to be a mason wasp rather than mason bee. So do your part and become a bee rancher yourself. You’ll be amazed at the activity and the new mini ecosystem that develops around the nests, while you benefit these neat pollinators and your garden as well. Avoid using pesticides, herbicides, and fungicides when possible. Plant for continuous blooms throughout the season (so you have continuous food sources). Use mass plantings as it's easier to see a bunch of plants blooming when flying than single blooms. Include native host plants for caterpillars and oligolectic (specific pollen requiring) bees. Provide basking spots when possible. Consider puddling areas for butterflies and mud plots for certain bees and wasps. Try to locate your garden in the sunniest location you have for best bloom production. Consider flower color and shape (reds are the worst, blue/white/yellow open top flowers that serve as landing platforms are the best. Composite flowers supply multiple food sources per landing). Avoid double-flowered or other cultivars/nativars as they often sacrifice nectaries for more showy petals. GO NATIVE! As evolution provided flower colors and shapes that pollinators found attractive rather than cultivated or introduced plants that people find attractive, best not to gamble and go with non-cultivars or nativars (very few of which have ever been tested for attractiveness to pollinators rather than people). Choose native plants, its what the pollinators chose and evolved. About 35% of our bees are specialists, depending on a limited range of plants (usually a genus or family) to collect pollen (though they can often nectar at many more). They cannot reproduce without the specific pollen of these plants they evolved with. They are oligolectic. If they collect pollen from a single species they are monolectic. If they use various plants they are polylectic. Most spring time solitary bees tend to use the same areas each year very early in the season, so try to have bee nests/structures out by early March. Bees, like most other insects are "cold blooded" not producing internal heat, so placing basking sites and nesting structures so they catch the morning sun but are out of the baking afternoon sun work best. Bees lay female-producing eggs the deepest in the holes/tubes that they can while male-producing eggs are closest to the entrance hole. To maximize the number of reproducing females tubes/holes should be 5-8inches deep. While 5/16inch diameter holes are a good compromise for many bees, vary hole sizes to attract different bees and wasps. 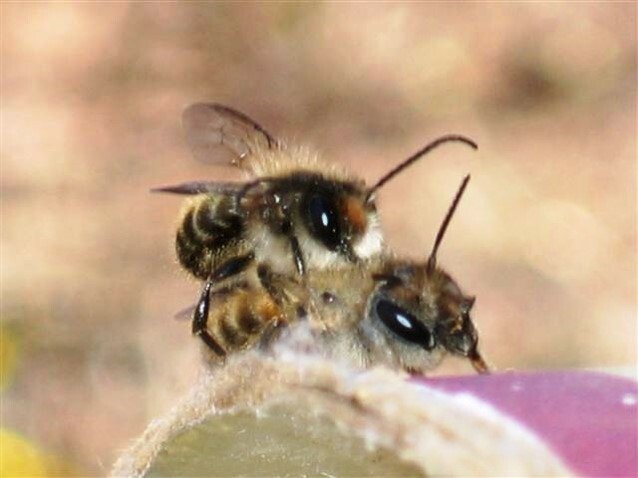 For better predator and parasite protection, most bees prefer structures and tubes/holes that are sealed off in the back. As most of the bees attracted are solitary, packing them close together attracts predators and parasites. Sanitary conditions of clean or new tubes/holes are best. Consider moving the colony every few years. Do not move structures once they are start being actively used. Each bee remembers where its individual hole is locates, so moving them often disorients and often leads to them abandoning their nests.Make sure they don't sway or move. In addition to having nearby nectar/pollen sources, mud sources are used by many bees and wasps, so maybe good to provide or have nearby. Provide protection form the rain and wind when possible, such as under roofs or eaves if the structure is not built with these protections in place. Consider placing large screen in front of of bee structures that have openings to easily let bees through but still protect against predators. Once all the holes/tubes are filled and sealed, they can be moved with no harm (perhaps to be stored in a cool garage or shed where they may be protected but still experience cold so as to not emerge early. Makes me want to get busy building! Join Money Market Mnathan for best Equity and Commodity Trading Tips. Traders can easily contact with us and get beneficial profit.